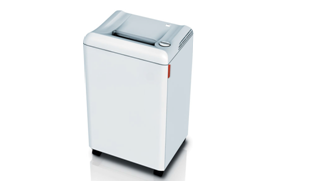 ”SPS“- (Safety Protection System) package: electronically controlled, transparent safety flap in the feed opening as additional safety element; EASY_SWITCH – intelligent control element indicating the operational status of the shredder with varying colour codes and back-lit symbols; automatic reverse and power cut-off (avoids paper jams); automatic stop if the shred bag is full; electronic door protection via a magnetic proximity switch; double motor protection; energy saving mode. Photo cell controlled automatic start and stop | convenient 260 mm feed opening | high quality paper clip proof cutting shafts from special hardened steel | strip cut model and 4 x 40 mm cross cut model suitable for safe shredding of CDs/DVDs | lifetime warranty on the cutting shafts | quiet but powerful 580 Watt single phase motor | dust-proof gear box housing and durable gears | high-quality wooden cabinet, mobile on castors | bag frame for disposable shred bags | 100 litres volume for the shreds. Security Level P-2 (DIN 66399) ทำลายแบบ Strip cut ขนาดเอกสารที่ถูกทำลาย 4 มม. ขนาดเครื่อง (สูง x กว้าง x ลึก) 870 x 500 x 377 มม. Security Level P-4 (DIN 66399) ทำลายแบบ Cross cut ขนาดเอกสารที่ถูกทำลาย 4 x 40 มม. Security Level P-5 (DIN 66399) ทำลายแบบ Cross cut ขนาดเอกสารที่ถูกทำลาย 2 x 15 มม. Or contact our consultant to see what this equipment can do for your business!